It's been awhile since I've done much spinning. When I have some craft time I tend to break out the crochet or knitting. I need to change that habit, especially since I really enjoy spinning once I sit down to it. Several of the Anacapa Spinsters - my usually-on-Thursday-night spinning group - got together for lunch and a spin-in at Ginny's house (thank you, Ginny!) 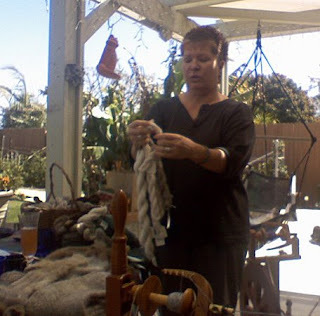 Susie brought angora bunny fur to share and demonstrated how to spin it by itself - fast whirl, lots of twist, not much tension - and carded with Merino wool. 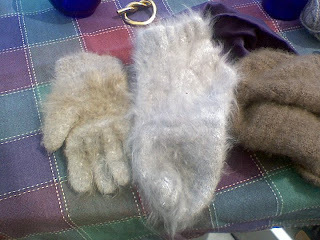 Her angora/wool mittens and all-angora socks were soft, silky and warm. 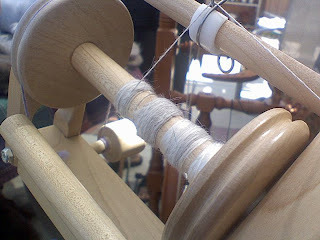 Plain angora wants to be spun thin - think thread; the wool/angora mix was much easier to control and spin at a more usable thickness. By the end of the day, I had about half a bobbin of angora, wool/angora and alpaca/silk (stunningly gorgeous stuff) that Susie had carded for us to spin. Now I need to find something to ply with it so I can see what this looks like crocheted or knit up.